Here, you can ask our visiting experts questions and receive helpful answers about planning ahead. Please note that before all questions and answers will be published at the discretion of the website manager. What are some key times when I should think about planning ahead? diagnosis of a life-limiting illness. What is ‘capacity’ and how is it relevant to planning ahead? It is only when you lose capacity that other people will need to make decisions for you. 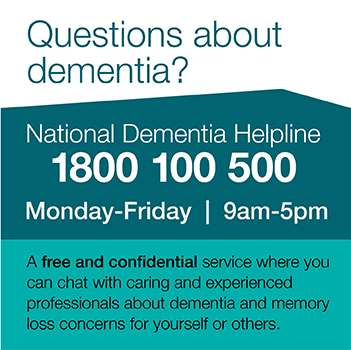 While people can lose capacity for many reasons, one of the most common is having dementia. This is because, over time, most forms of dementia affect the person’s ability to remember and process information, solve problems and/or express themselves. The number of people with dementia is increasing and many people in the community are aware that they may develop this condition in the future. They want to prepare for this possibility and make sure that their wishes and choices are known and respected. Planning ahead allows a person to do this while they still have capacity. If you make an effort to plan ahead, are your wishes legally binding on others? In all States/Territories you can legally appoint someone to make financial decisions on your behalf, at a time or situation that you nominate. In every State/Territory except the Northern Territory you can legally appoint someone to make decisions about personal and health matters, in case you lose the capacity to make your own decisions. All States/Territories except New South Wales and Tasmania have specific legislation relating to writing down your wishes regarding your future health care choices. These are referred to as ‘statutory directives’. It is generally accepted that directions written in documents other than statutory directives will be legally binding under common law, although there have been very few court cases to confirm this for all States/Territories. These types of documents are referred to as ‘common law directives’. there is no indication that the person has changed their mind since making the directive. My brother holds an Enduring Power of Attorney for my mother. Does this mean that he can decide on whether or not she has an operation for her cancer? No – an Enduring Power of Attorney only gives a person the right to make decisions about another person’s finances. Each State/Territory has a slightly different way of working out who can make healthcare decisions for another person. Have a look at the information on this website for your State/Territory to see who would be the appropriate person to make healthcare decisions in your situation. If I make an advance care directive now, can I change it later? Yes – you can change or cancel it at any time, as long as you still have capacity. If you do change it, it is important to contact anyone who may have a copy and make sure they have the newer version. I have made a written advance care plan. What should I do with this document? You should give copies to people who may have to make decisions for you in the future as well as your doctors. As well as giving copies, it is important to discuss the documents with these people so they are clear about how to use them. You could send a copy to your local hospital if you have a file there and ask for it to be included in your file. You could take a copy with you if you are ever admitted to hospital or a residential care facility. * Marked fields are mandatory. Enter your name as you wish it to appear beside your story - this does not have to be your real name, if you wish to remain anonymous.